Note the hot pressing process uses compressed air to the injection machine with paste wax hot pressurized puffer type injection machine. Is the use of a thermostat closed pulp barrels and compressed air sent into the paste wax injection molding. Before molding, the hot melt injection molding of good paste wax into the slurry bucket, ohmic heating the wax slurry reach the required temperature. Outside pulp barrels is to maintain a constant temperature oil bath barrel, barrel thermometer inserted into the node, connected to the relay to control the temperature. When molding, the mold injection machine into the slurry at the mouth of the stock inlet, foot compressor valves, rams grouting apparatus of the pressing mold, and compressed air into the pulp barrels, the slurry is pressed into the mold. After maintaining a short stop into the slurry discharged compressed air. The mold is opened to remove the hardened body with a knife slashing port injection grouting material, trimmed to qualified green. 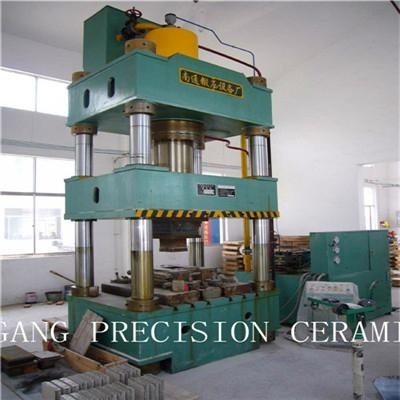 Push plate tunnel furnace for dry pressing piezoelectric ceramic firing, burning material. (2) Rated temperature: 1400 ℃. (3) the number of temperature control Group: 6 zone heating, 9:00 temperature. 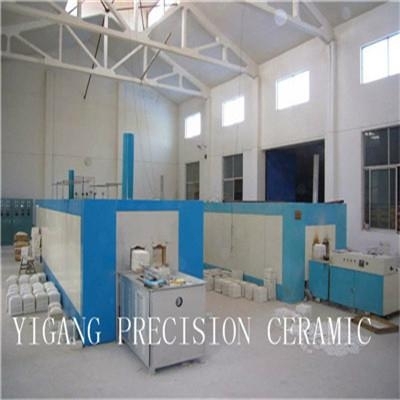 (4), the outer furnace temperature: ≤50 ℃. (5), heating heating power: ≤ about 80KW. (6), holding power: about ≤45KW.